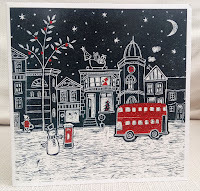 Here's my final card for Shopping Our Stash , where I'm delighted to be the Guest Designer for January. The challenge is to make something with a vintage/shabby/distressed look. 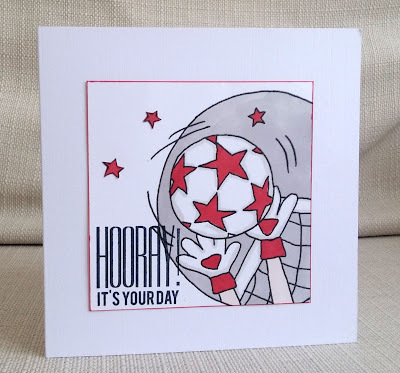 Here I used a stamp that is virtually vintage itself,I've had it so long! I paper-pieced it and then threw every grunging-up/ distressing trick I know at it. 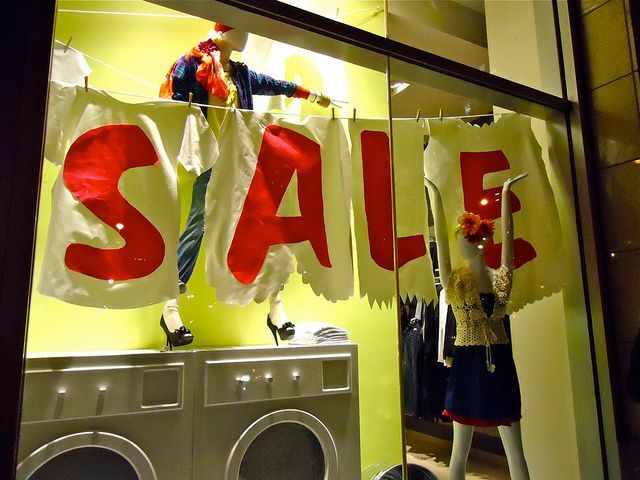 I've loved being Guest Designer at Shopping Our Stash and I can fully recommend it to you. Why not join in the challenge and put 'DT' after your name? You might be picked next time. This week at City Crafter , Stella wants us to use just black, white and a splash of aqua. 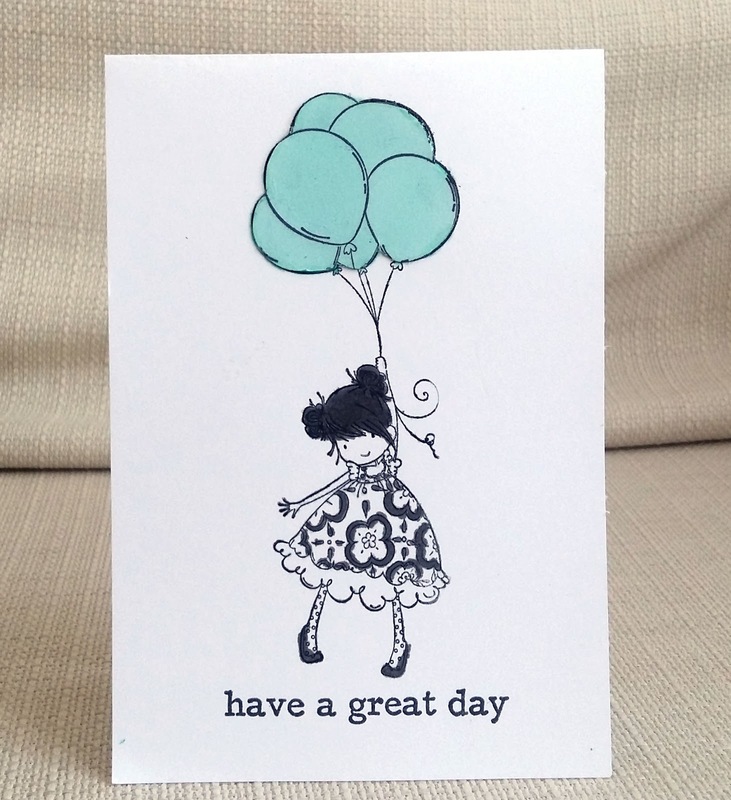 I used a Stamping Bella image and a Clearly Besotted sentiment and just coloured with alcohol markers. Our special Guest Star, Danielle , is still with us, so please come over to the challenge blog and see what she and the rest of the DT have made, and enter your own project. 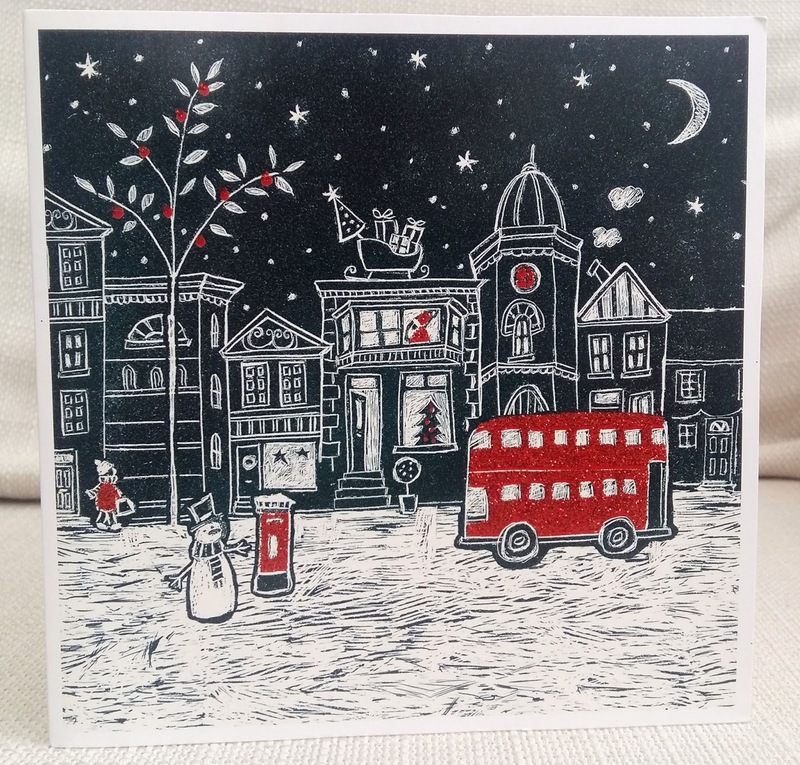 Better crack on with the Christmas cards - only 11 months to go! I made a stencil using free clip art that I traced and cut on the Silhouette. I stamped the fox and bird stamp (Penny Black) masked them and stencilled the trees and ground. I coloured the image with alcohol markers and then stencilled snow with texture paste and glitter. It really does sparkle nicely in real life! 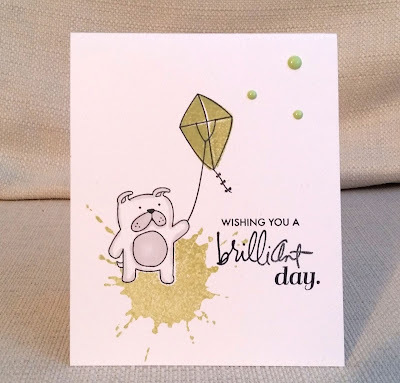 I hope you'll join in with the challenge, but first, do come over to Inkspirational and see what our Guest Designer Jane and the rest of the DT have made. Tomorrow, my youngest child hits double figures. He is football (soccer) mad. He plays for his school and for a local team and is an ardent supporter of Arsenal. He often plays in goal. Actually, we ordered him a football rebounder for his present and Amazon delivered it to our porch. Unfortunately they failed to put it into an Amazon box and so when we came home one day last week, he was able to see from the picture on the packaging exactly what he's getting. Annoying. So, for his birthday card I used a digital stamp by Lily of the Valley. I printed it large and cropped it at the corner. I coloured it with alcohol markers. Then I stamped a sentiment by My Favourite Things. The two stars on the white card were originally on the part of the image that was cropped away, so I cut them out and stuck them on. My New Challenge for 2017 - Pro-Am Showdown! Every year I like to set myself a crafting challenge, but my self-set challenge for 2016 wasn't as successful as I'd hoped. So....if at first you don't succeed- set yourself an easier challenge! I seem to have quite a lot of mass-manufactured cards that I've been given at Christmas and birthdays and kept because I liked them and thought I'd steal some ideas from them for my own cards. 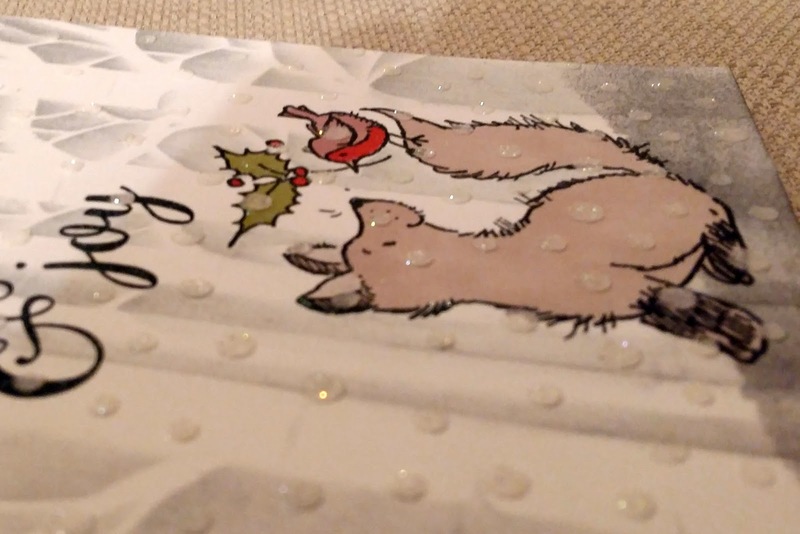 So this year I'm going to work my way through the pile of shop-bought cards and try to beat the professionals by poaching their ideas and making cards that are even better! 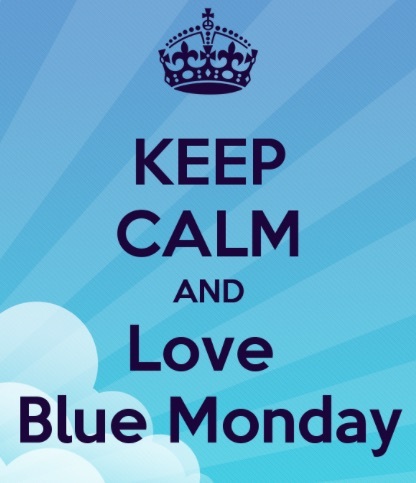 (Well I can try!) I contacted Simon Cowell , but unfortunately he wasn't available for judging so, officially, my challenge isn't to beat them, just to CASE at least 24 cards during the year. 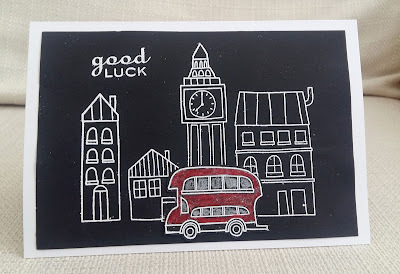 What I liked about the professional card was the black/white/red combo , the glitter on the red accents and that it had a London theme - I live near London and commute in every day. 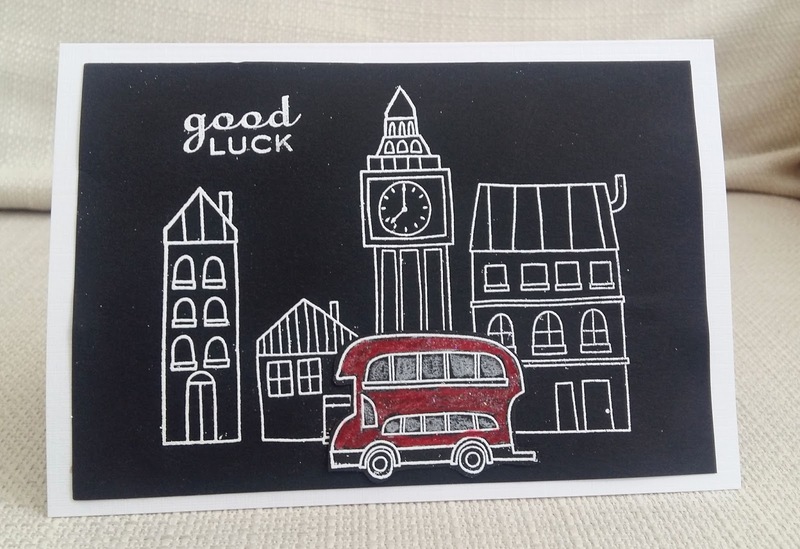 My own twist was to make it a 'good luck on your new job' card. 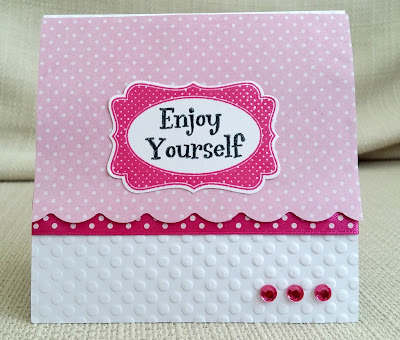 I used My Favorite Things stamps (plus the sentiment by Persona Impressions) and heat embossed in white. The bus was coloured with pencils and cut out and glittered - originally I used Wink of Stella but it just didn't show enough, so I used fine clear glitter. It would have been better if I'd had bright red glitter glue. I know in the photo it looks like I've got stray embossing powder everywhere but in fact it's actually bits of stray glitter catching the light in the photo. I must confess that I think the professionals have won this time. Their scene has a bit more interest and their glittering is better. But I think I gave it a good go. 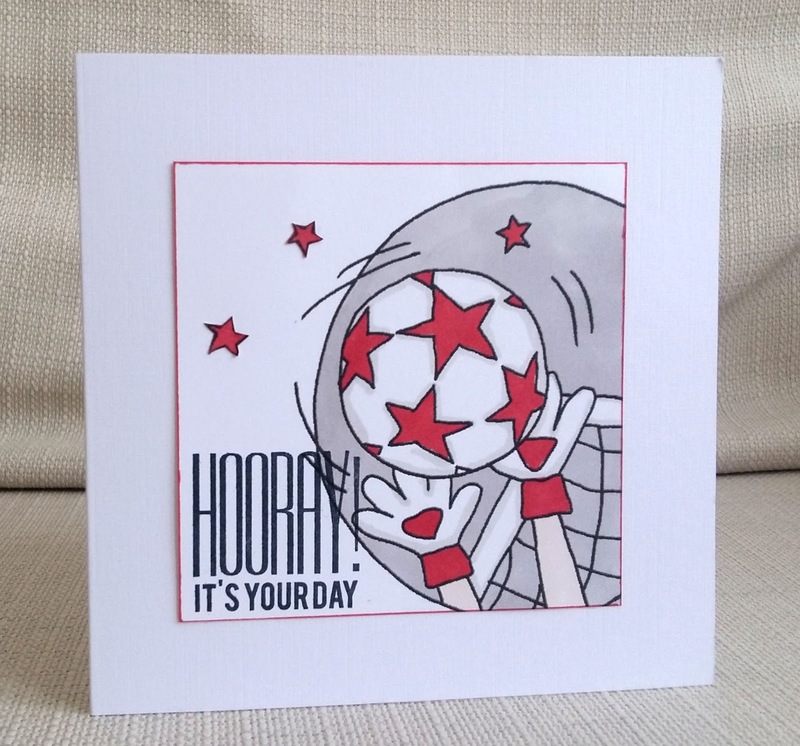 Here's another card for Shopping Our Stash , where I'm delighted to be the Guest Designer for January. This week's challenge is 'all that glitters is gold'. 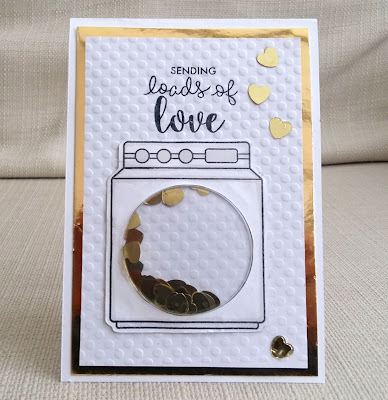 I've made several really glitzy gold cards lately, especially for Christmas and New Year , so I wanted to see if I could make use gold in a more subtle way. So this card is very simple - I made a base from kraft card, and stamped the bird and two flower stamps (Woodware) and sentiment (My Favorite Things) and heat embossed them in gold. It might be too minimal for some tastes but I can think of several people, male and female, who I could send this to. I'm really enjoying guesting at Shopping Our Stash ...next month, it could be you...all you have to do is enter the challenge at put DT after your name to be in with a chance. This week, at City Crafter , Kirsty has challenged us to use confetti on our projects. 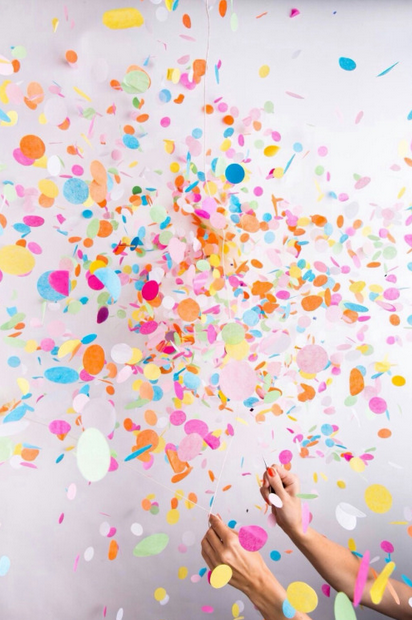 I really couldn't say how long I've had this gold hearts confetti - I can barely remember a time when I didn't have it! And there's still plenty left! So, I used it in a shaker card. 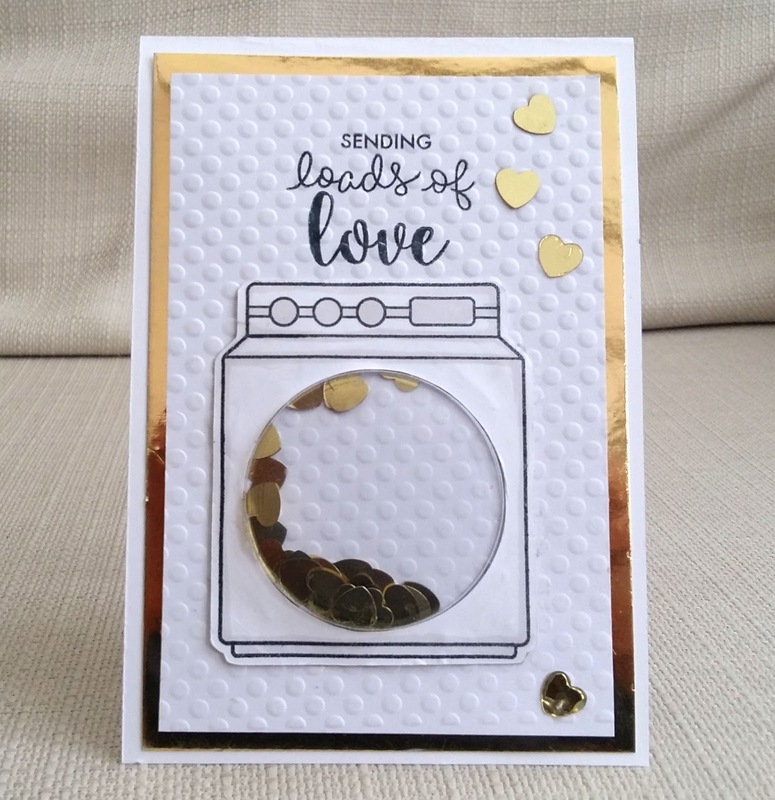 The washer and the 'loads of'' stamps are by Lawn Fawn, and the 'sending' and 'love' sentiments are by Avery Elle. 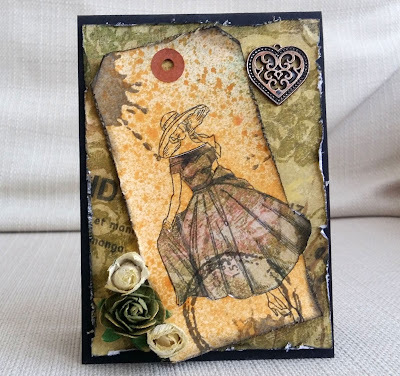 I dry-embossed the background and matted it onto mirror card. 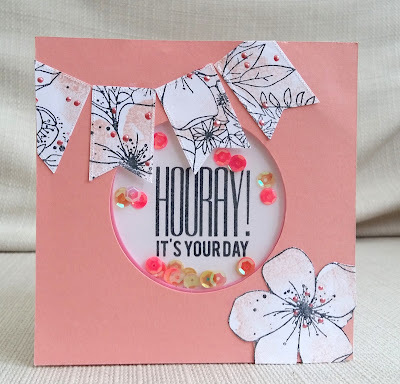 Our wonderful Guest Star , Danielle , is still with us, so I hope you will come over to the City Crafter blog, see what she and the rest of the DT have made, and enter your own confetti project. 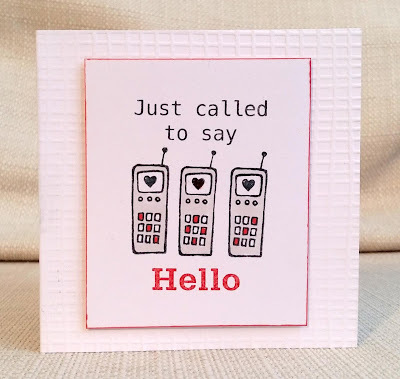 Regular visitors to my blog may know two things about my daughter- first, she works as a midwife, and second, she likes to give me real-life cardmaking challenges , usually at short notice. On Friday she asked me to make a thank you card for a woman who knits baby hats and donates them to the hospital. I immediately thought of this knitter image, which is a Pure Innocence digi. I coloured it with alcohol markers and paper-pieced it with a Basic Grey paper, which I also used to cover the base card. ( I actually love how the paper-piecing turned out on the shoes). 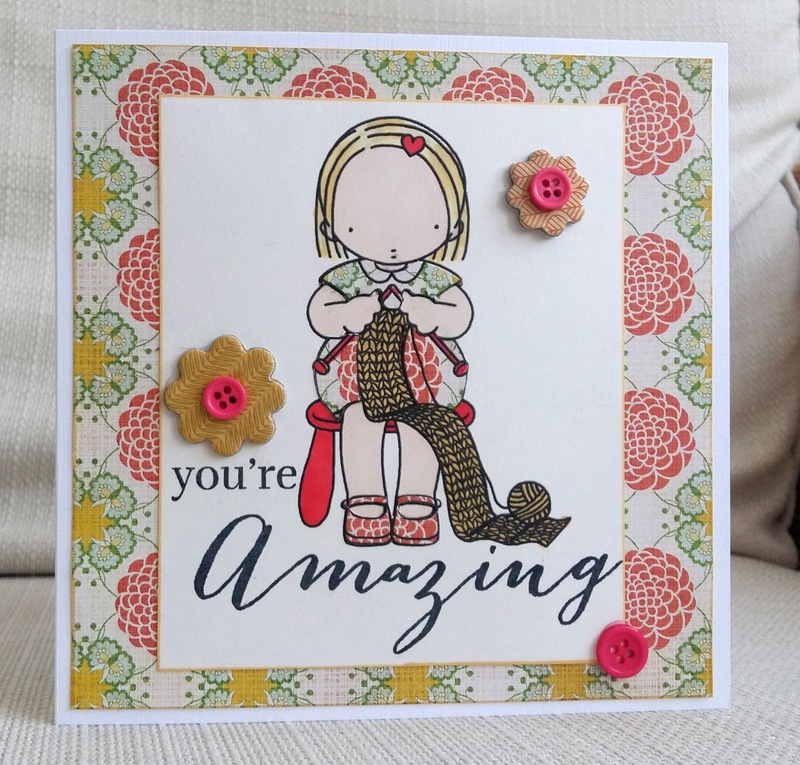 The sentiment was made with stamps by Waffle Flower and I embellished with buttons. Craft Purple Frog new beginnings - see above. 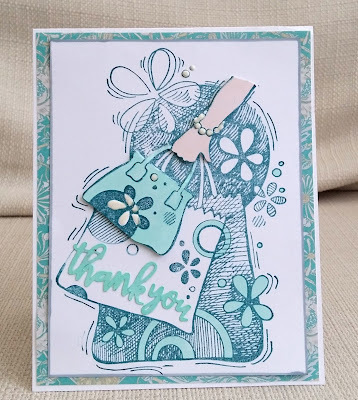 For my DT card, I used a very old Stampendous stamp that I stamped in blue, I stamped the arm and small handbag again, coloured them, and popped them up on foam. I die cut a 'thank you' and added Wink of Stella. I added highlights with white enamel accents and liquid pearls. Of course you can't see all the shiny bits in the photo..I hope you believe me! I really hope you'll come over to City Crafter and see what our fabulous Guest Designer, Danielle, and the rest of the DT have made, and enter your own sales-inspired creation. This month I have the honour of being Guest Designer for Shopping Our Stash , and the challenge this week is to feature a 'fantastic beast'. The background was made with Brushos and I distressed the edges. 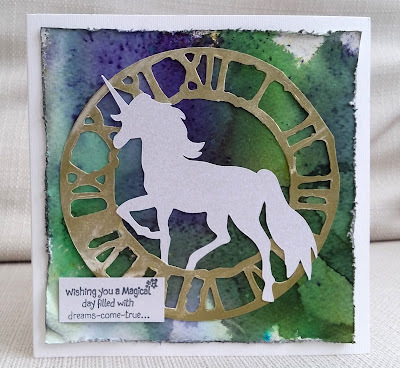 The clock dial was cut with a Tim Holtz die and I coloured it with gold gilding wax. The unicorn was a picture I traced on the Silhouette and cut out of pearlised white card. 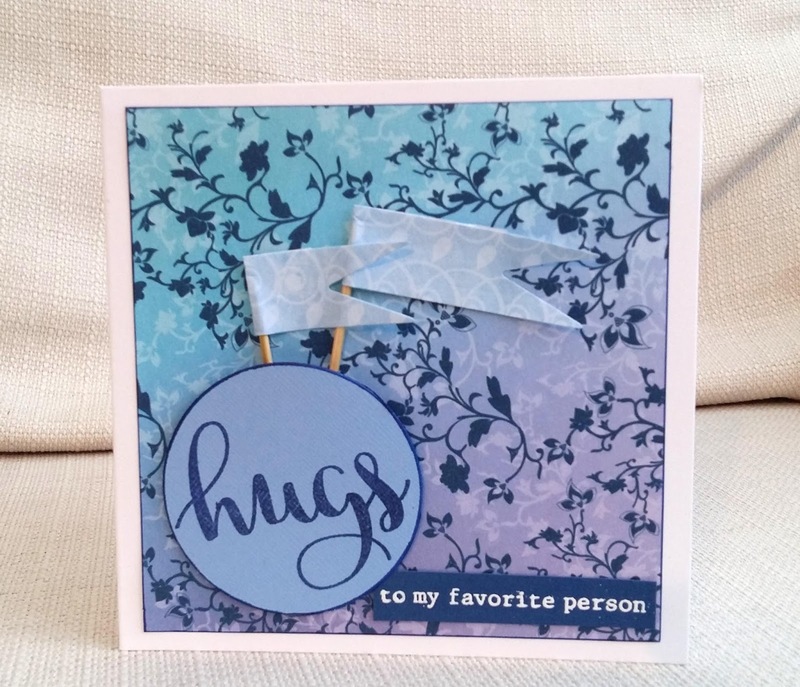 The sentiment is a Docrafts stamp. I hope you'll come and join in at Shopping Our Stash. Our challenge at Inkspirational is to be inspired by the word flutter. I went for bunting/flags fluttering in the breeze. I cut the bunting on the Silhouette and stamped it with my new stamps from Concord and 9th. 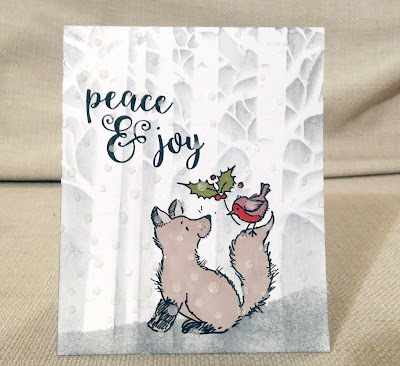 I made a shaker card and stamped the back panel with a sentiment by My Favorite Things (also new for Christmas!). I added some pink liquid pearls. 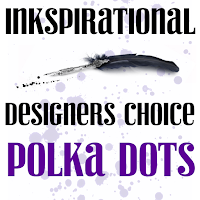 This time, our wonderful Guest Designer is Gina , and I hope you'll come over to Inkspirational and see what she and the rest of the DT have made, and enter your own project. I've never been to Canada,but my daughter and grandchildren visited there last year. So when I saw the 'Oh Canada' challenge at Use Your Stuff , I thought it'd be a good opportunity to scrap one of their holiday snaps. I used a combination of papers from My Mind's Eye and plain cardstock. I designed and cut the title and the maple leaf on the Silhouette Cameo (actually the partial cutting on the leaf was a bit of an accident but I like it). I used lots of grey, to enter the challenge at Another Freaking Scrappy Challenge and buttons for Lasting Memories. 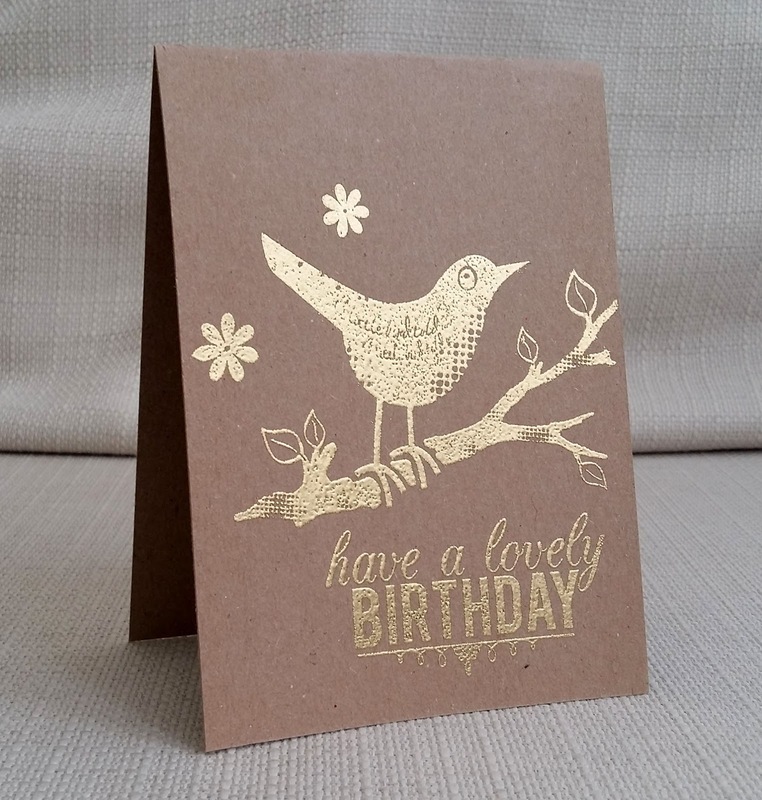 Happy Birthday to Ros my dear team-mate at City Crafter Challenge Blog . I hope she's received this card in the post. With Ros in mind I used elements I think Ros likes (eg trees, soft background) and in doing so inadvertently made a card that is quite influenced by her own style, I think! 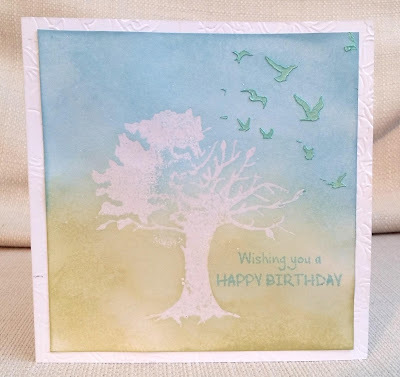 The tree and birds are a Clarity stencil that comes with the cut out bits to use as a mask. I used the tree mask as a stamp and stamped it in Versamark and then embossed it with white pearl ep. Then I placed the matching stencil over it and did the birds, using my new Nuvo mousse. The sentiment is a magazine freebie stamp. I actually made this before Christmas and when I came to send it, I couldn't find it anywhere! I searched for days until I gave up and decided to make a replacement. I was just drying the background with a heat gun when it came to me in a blinding flash.... I'd put the original card under a pile of books to flatten it out! So, now I have a spare background to use for something else. Ros ...I hope you have a great day. Happy Little Stampers Watercolour I used a stencil plus water and distress inks for the background. This week at City Crafter, Stella wants us to create a project to cheer someone up. 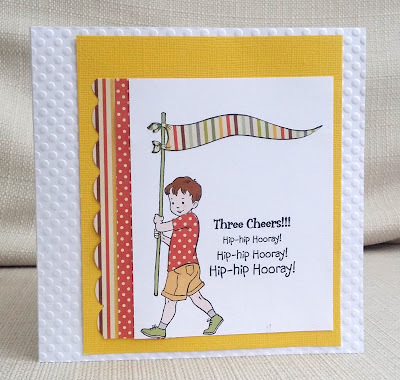 Here I used scraps of patterned paper, for the background, and for the flags.The sentiments are by Avery Elle. 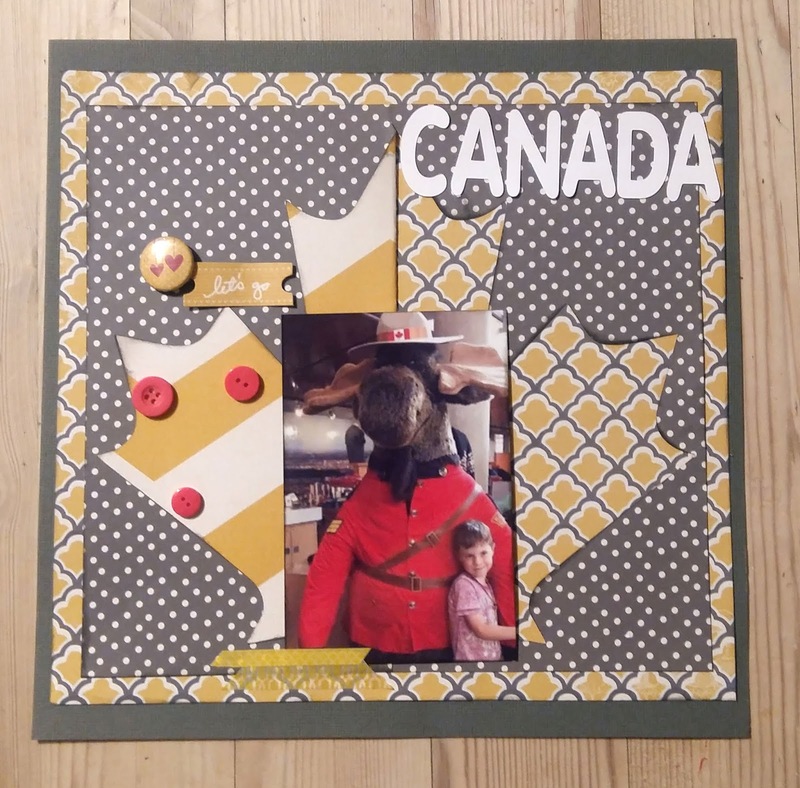 Our special Guest Star for Janary is Danielle , and I hope you will come over to City Crafter and see what she and the rest of the DT have made, and enter your own creation. 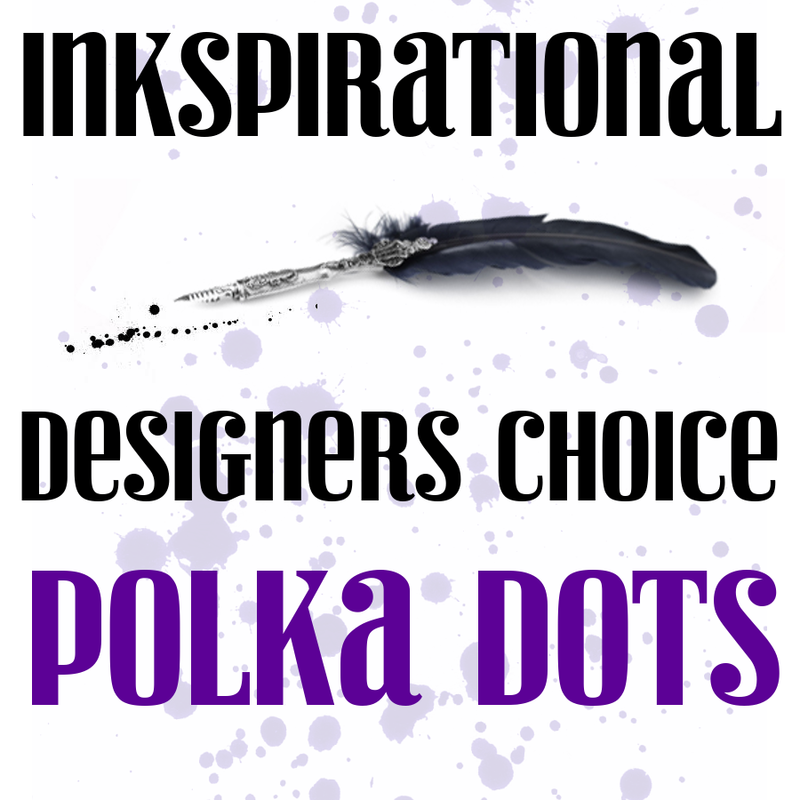 I'm delighted to reveal that for the rest of January, I will be the Guest Designer at Shopping Our Stash ! 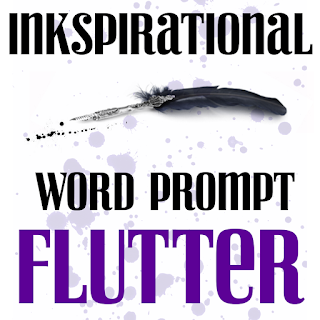 The first challenge theme is 'Stickle me Elmo'- use Stickles (or similar glitter glue). This was a great challenge for me as , although I use white/clear types of Stickles often, my coloured Stickles needed a lot of poking with a pin to unclog them. 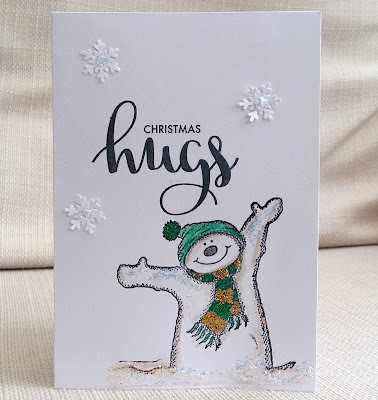 I stamped this well-loved old snowman stamp (Funstamps) and coloured it with my new polychromos pencils (a present) . I added clear Stickles to the snow and gold and green Sticles to the scarf and hat. The sentiments are by Avery Elle. I punched some snowflakes and added Stickles to them. 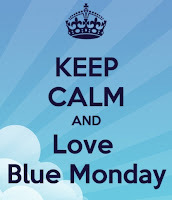 I hope you too will unclog your Stickles and join in the challenge. So, Did I Conquer Paper Mountain ? 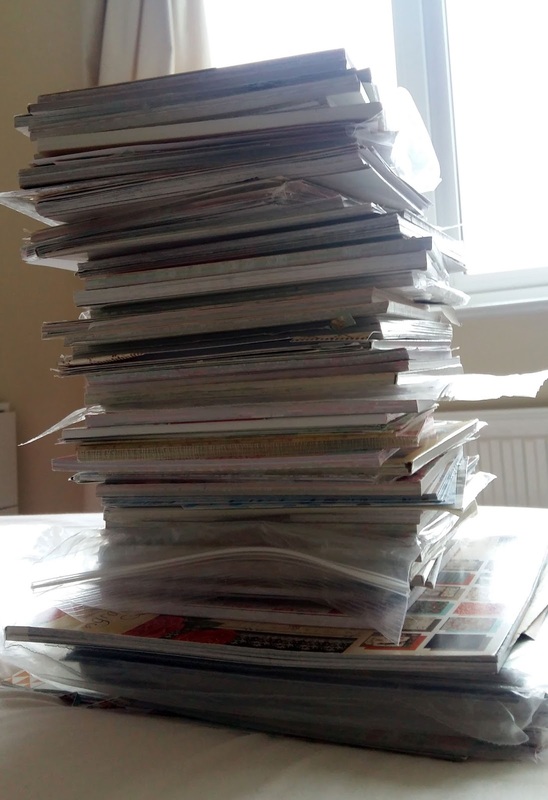 Just over a year ago I posted a photo of my Paper Mountain and said that my challenge for 2016 was to reduce the pile of patterned paper pads from 33cm (13 in) to a maximum of 27cm (10.5 in) . I intended to do this by making mini-books etc ( mmmm didn't happen!) and using them in cards - which I did, but I made so many cas and olc's this year....! Yes! That's 1.5 cm short of my target! This is my first fail on the craft challenges I have set myself . 2015 - Empty Box Project here and here where I emptied a box of unused stamps. 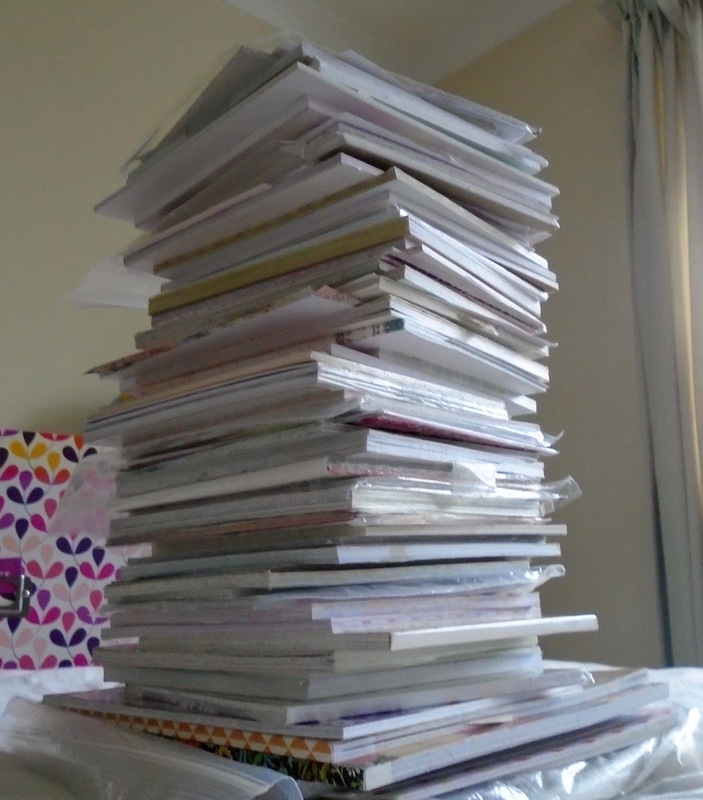 So the positive is ...I have barely added to my paper mountain (at least for mini pads) all year .. 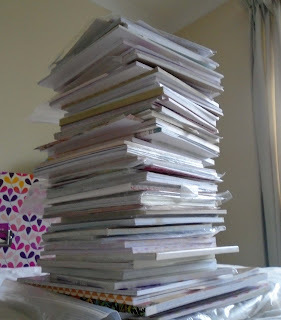 I've reduced the pile by 4.5 cm . And I have more than enough lovely patterned paper to keep me going for many years to come. Well, I managed to get the Christmas decorations down yesterday...only a day late! When the decs come down I always think how plain my home looks! Anyway, here's a card that I made to play along with a few challenges. I used the sketch from Seven Hill's Crafts as my starting point. To enter the 'cats or dogs' challenge at Allsorts , I stamped the dog (W plus 9) , which is from a new set I received for Christmas. ( So I'll enter Little Red Wagon's something new challenge). 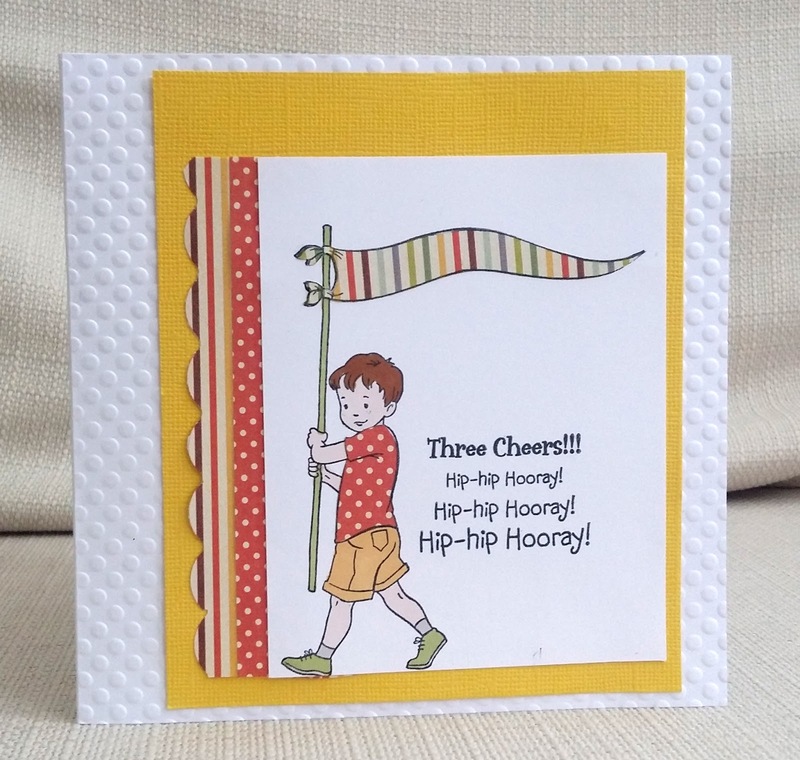 The kite from the same set fits in with Cards 4 Guyz and Moving Along with the Times . 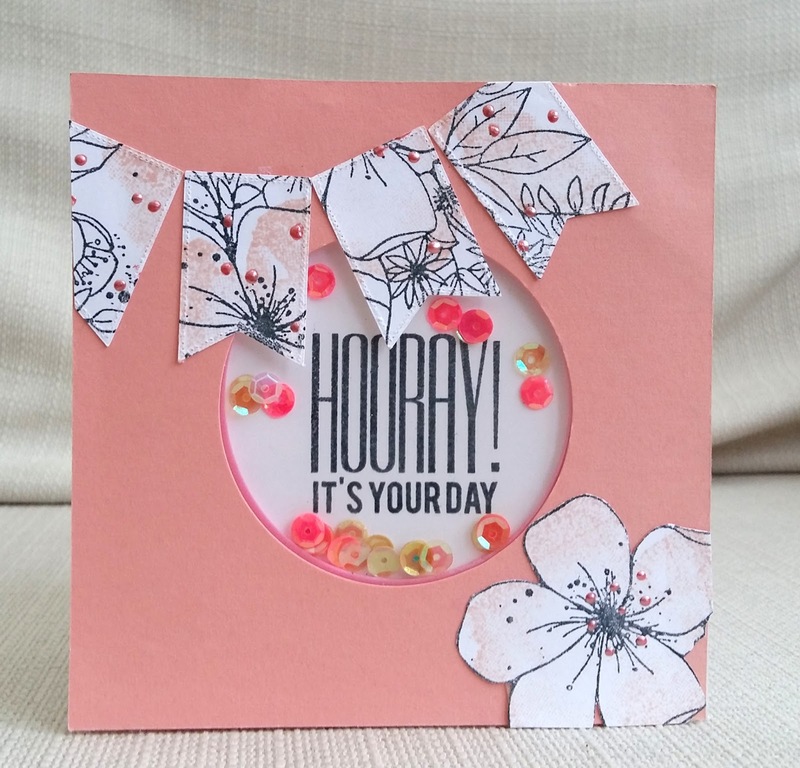 The splatter is a stamp by Creative Expressions and the sentiment was made up of stamps from Avery Elle, Heidi Swapp and Waffle Flower. 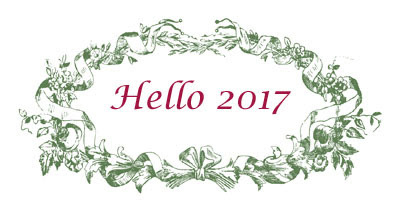 It's the first challenge of the year at City Crafter, and Kirsty wants us to use the word 'hello' on our projects. I used a phone stamp by Sweet Dixie and stamped it three times. 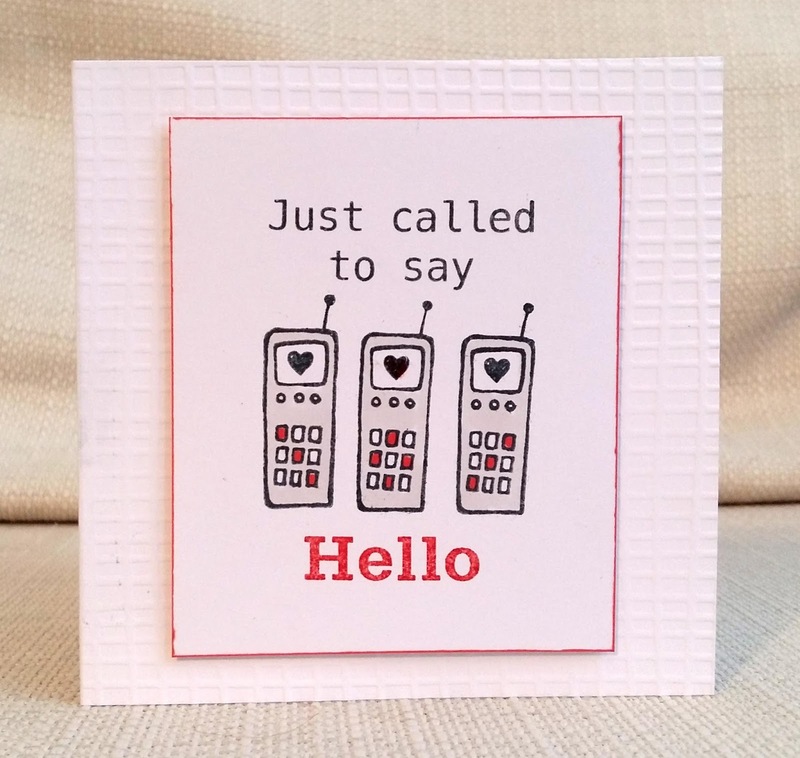 'Just Called to Say' is from the same set, and the 'hello' is Personal Impressions (I think!) . I know it's supposed to be New Year, New You; but here I've used old stash ( the stamp is by October Afternoon, sentiment by Docrafts) and an old, favourite technique (paper-piecing). The only thing new is the (strange?) 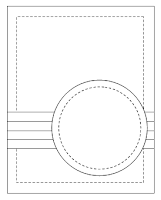 layout of the card. In fact, the yellow cardstock was originally going to be the base card but then I stuck the stamped panel on upside down! So, I had to cut it up and stick it onto another card base, which I thought I'd do in an offset way. New Year, same clumsy old me!